I just returned from a pleasant one week vacation in a little cottage on the western coast of Denmark. But as there was no connection to the Internet whatsoever, one of the first thing I did when I was home again was to visit the newly resurrected ElvisNews.com site as well as a few others to get myself up to speed again on things Elvis wise. 1. 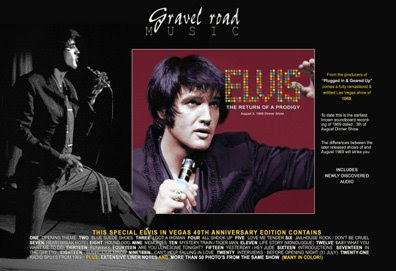 A soundboard of the August 3, dinner show in Las Vegas, released in 1993 by Ford Baxter under the misleading name Opening Night, is to be re-released under the name of Elvis - Return Of A Prodigy. It's supposed to be edited, as to why I have no idea. I own a copy of Opening Night and gave it a spin today. In short I found it pretty similar to the shows recorded professionally by RCA a couple of weeks later. Elvis is clowning around quite a bit, but maybe not as much as a bit later into the engagement. I guess he was still feeling a bit nervous as this was only the sixth show he gave. Some of the arrangements also sound different, this is particularly true on "Are You Lonesome Tonight" where there is no high voice singing, instead that part is being played by a violin. 2. EPE's latest marketing item is a backstage pass where "you can explore Elvis’ dressing room as it may have looked during his historic 1969 engagement at The International Hotel. Included in the virtual online experience, are photos, artifacts, audio and video clips and lots more online fun." Coming from EPE, maybe not surprisingly this "fun" costs money, $1.99 for 24 hours of access. 3. Much more interesting is the Elvis: Vegas '69 book written by Ken Sharp, the guy who also put together Writing For The King, among others. Elvis Australia, another great Elvis site I favour, posted a review and after reading it, I have to say it sounds like a promising book. Not only does it include a lot of previously unseen photographs, it also features first hand accounts of those who "where there." One of those, a lucky Mr Ian Fracer-Thomson, not only succeeded in sneaking into the opening night invitation only show, he also watched and listened to a large part of the dress rehearsal.